Download the complete volume for free (2.1 MB, pdf). Buy the printed edition ISBN 978-1-4632-0622-2. The habits of mind which gave Israel’s ancestors cause to doubt the existence of the pagan deities sometimes lead their descendants to doubt the existence of any personal God, however conceived. Monotheism was and is a powerful form of Scepticism. The Hebrew Bible contains notable satires of Paganism, such as Psalm 115 and Isaiah 44 with their biting mockery of idols. Elijah challenged the worshippers of Ba’al to a demonstration of divine power, using satire. The reader knows that nothing will happen in response to the cries of Baal’s worshippers, and laughs. Yet, the worshippers of Israel’s God must also be aware that their own cries for help often go unanswered. The insight that caused Abraham to smash the idols in his father’s shop also shakes the altar erected by Elijah. Doubt, once unleashed, is not easily contained. Scepticism is a natural part of the Jewish experience. In the middle ages Jews were non-believers and dissenters as far as the dominant religions were concerned. With the advent of modernity, those sceptical habits of mind could be applied to religion generally, including Judaism. The results were volatile – and still are. Monotheism, by simple definition, implies a belief in one God for all peoples, not for one particular nation. But as the Shemah prayer recalls, God spoke exclusively to Israel in insisting that God is one. This address came to define the essential nature of the Jewish faith, setting it apart from all other faiths both in the pre-modern and modern worlds. 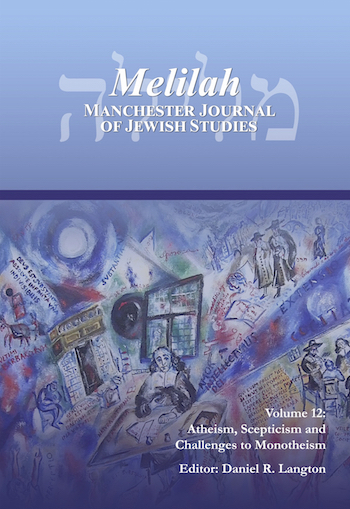 This essay explores the positions of a variety of thinkers on the question of the exclusive status of monotheism in Judaism from the Renaissance until the present day. It first discusses the challenge offered to Judaism by the Renaissance thinker Pico della Mirandola and his notion of ancient theology which claimed a common core of belief among all nations and cultures. It then explores the impact of this universal philosophy of Christianity on a group of early modern Jewish thinkers; considers its repercussions among Jewish thinkers in the nineteenth century both in Western and Eastern Europe; and finally focuses on one contemporary Jewish reflection of the vision of Pico in our own day. Abraham ben Asher’s Or ha-Sekhel, an exposition of Genesis Rabba, was published in Venice in 1567. The author frequently interprets midrashim by listing and then harmonising series of “doubts” or “questions” (sefekot or sheʾelot) that arise in the text. The present study analyses this mode of exegesis by examining Abraham ben Asher’s interpretation of the exposition of the Call of Abraham at Genesis Rabba 39:1. The midrash likens the biblical account (Genesis 12:1) to a wayfarer who, on seeing a burning building, asked whether anyone was in charge and was subsequently confronted by the owner. Thus Abraham asked whether anyone was in charge of the world and then received his divine mandate. Abraham ben Asher begins his interpretation with a startling observation: the midrash seems to imply that Abraham questioned the existence of God. In the harmonising interpretation that follows, Abraham ben Asher reassures the reader that the patriarch considered the nature of divine providence rather than God’s existence. Nevertheless, as this paper argues, he deliberately led his audience to entertain the notion that Abraham once lacked a proper understanding of monotheism. This serves a rhetorical purpose, capturing the reader’s interest in how the expositor will solve the problem he raised. 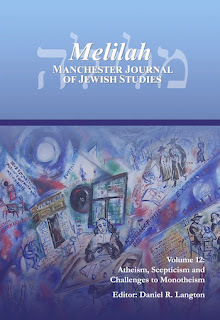 By assailing readers with questions and then providing solutions, Abraham ben Asher also creates the impression that any uncertainties that may arise in the study of midrash will inevitably have satisfactory resolutions because the sages’ words can always be expounded so as to reveal harmonious and coherent interpretations. It is a truism that Jewish polemical/apologetic texts have been written since Late Antiquity with the main purpose of strengthening the faint-hearted members of Jewish communities throughout the globe. Hence the existence of this kind of text implicitly suggests the presence of some form of “religious scepticism” or feeling of uncertainty in the ranks of the Jewish population. On the other hand, since the beginning of the early modern period a radical change can be felt in the genre. The sceptical figure, who had been present previously only hidden in the background of the texts, now came forth from behind the scenes, and took a clearly identifiable shape, like Shimi, one of the protagonists of the polemical drama, written by the Italian playwright Matityahu Nissim Terni (1745– 1810), entitled Derech Emunah (“The Way of Faith”). In this paper an attempt will be made to analyse Terni’s drama as a very sensitive psychological portrayal of the complex personality of an average Italian Jew of the ghetto age, reconciling successfully the technical requirements of contemporary dramaturgy with the specific values, expectations and tantalizing questions of the Jewish community of his age. In a seemingly contradictory manner, Moses Mendelssohn steadfastly argued for classical metaphysical postulates such as God, providence and immortality on the one hand, and held a sceptical approach towards metaphysics on the other. This tension is resolved through the appraisal of Mendelssohn’s position as sceptical of what he took to be exceedingly speculative thinking in general, and the overly abstruse arguments sceptical philosophers have used to attack commonsensical truths, which he depicted as simple and self-evident, in particular. At first sight, Mendelssohn’s scepticism of scepticism and its turn towards a philosophy that emphasizes not only the trustworthiness but also the truthfulness of commonsensical thinking, seems to radically subvert scepticism. Yet, Pyrrho’s philosophy, widely perceived to be the foundation of the sceptical tradition in Western philosophy, also very much relied on common sense, a reliance which suggests it might have tacitly adhered to the epistemological principles Mendelssohn explicitly advocates. Rather than subverting scepticism, Mendelssohn’s scepticism of scepticism therefore reflects a characteristically moderate and nuanced approach, one offering a profound reappraisal of what scepticism is in thought, and what it ought to be in life. The attempts of Mordecai Kaplan and Ludwig Wittgenstein at reforming Jewish theology and analytic philosophy respectively share some important traits. While Kaplan’s scientifically respectable “atheistic” Judaism sought to reinterpret theological principles in line with a modern-day materialist vision of the cosmos, Wittgenstein’s reductionist anti-metaphysical philosophy attempted to show that language often leads thought astray by concealing unjustified presuppositions. Both thinkers were involved in a process of cleaning language – of removing terms from common use in order to refine, redefine, and strip away layers of misleading mythology so that they can be returned, purified, to everyday use. This paper will examine their thought side by side in order to demonstrate the similarities between their thought as well as what they can teach us about the role of metaphysics in deconstructing the theism-atheism binary. I will argue that there is a current of immanence which unites their efforts, flattening the world into a phenomenal-experiential plane where religious terminology is still retained as crucial for the exercise of meaningful human life but is understood to relate to the immediate lived experience. As a result of this de-ontologising, religion becomes a matter of ideology rather than objective truth and ethics becomes paramount. This paper addresses the religious notion of “textualism” – the formalistic assumption that a text is meaningful only when it is understood in itself and solely from itself. In the present paper, I will implicitly refer to this legal notion of “textualism” but I will be more generic with respect to the interpretation of the text and more specific with respect of the nature of the text itself. On the one hand, I will refer to “textualism” as to the hermeneutical assumption that the meaning of a text is inherently autonomous and does not require extra-textual sources; on the other hand, I will specifically refer here to religious texts and assume that they shall not be understood outside from their inherent cultural perimeter. Critical Bible scholarship reveals much diversity in ancient Israelite notions of God, but whatever the theology, the Bible rarely leaves room for doubt that God is alive, alert, vigorous and righteous; even Job, despite his sense of injustice, does not doubt that ultimately God is just, and is in control of events. Modern times have seen a change of attitude, not simply on account of the apparent injustice in the world, but more fundamentally because the successes of science have made God redundant as an explanation for natural phenomena. Twentieth-century Jewish thinkers such as Mordecai M. Kaplan have sought to replace God by social constructs, while those who retain traditional God-talk range from Heschel, whose “anthropopathic God” shares human emotion, to Eliezer Berkovits (“the hidden God”), and from J. D. Soloveitchik (the God of halakha) to Richard Rubenstein (the non-interventionist God) and David Blumenthal (God as abusing parent). In this paper I shall review some of the main theories, while enquiring whether their proponents have anything in common with ancient and mediaeval believers, or whether they have subverted the older God-language, in some cases attenuating the concept of God to the point of atheism. This article suggests that Second Wave liberal Jewish feminism combined secular feminist criticism of the ideological roots of social injustice with traditional criticism of idolatry. Together, these closely related discourses allowed Jewish feminists to argue, with Christian feminists of the time, that the monosexual God who demands that idols be broken is himself an idol: a primary ideational and linguistic projection whose masculine character obstructs the political and existential becoming of women. Liberal Jewish feminists such as Judith Plaskow, in dispute with early Orthodox Jewish feminism, therefore insisted that Jewish feminism must begin with a counter-idolatrous reform of the theological concepts that underpin the relationship between God, self, and world, not with making permissible alterations to halakhah. However, while liberal Jewish feminists reclaimed some of the female aspects of the Jewish God (notably the Shekhinah), the point of reforming a tradition is to be faithful to it. They did not join their more radical Jewish sisters in a more or less pagan break with ethical monotheism, not least because the latter’s criticism of idolatry funded their own prophetic drive to the liberation of both women and God from captivity to their patriarchal idea. Popular culture’s fascination with scepticism and science provoked a number of responses from Reform rabbis in late nineteenth-century North America. Darwin’s theory of natural selection, which suggested that purely materialistic mechanisms accounted for the variety of life, and biblical-criticism, which implied that the irrational elements of the Bible made it largely irrelevant to faith of the modern, sceptical Jew, were just two prominent examples of the kind of ideas that challenged the traditional status quo. Several prominent Reform rabbis responded with Jewish theologies that encompassed organic evolutionary theory while espousing biblical creationism of one sort or another. Joseph Krauskopf was one such rabbi whose Evolution and Judaism (1887) adopted a sceptical approach to traditional readings of the bible and yet which, in attempting to justify Jewish religious continuity, taught a Jewish form of panentheism that viewed the universe as an evolving phenomenon and hinted at the reality of life beyond death. This paper uses the term “secular theology” to criticize Jewish-religious approaches on the one hand and atheism on the other hand. It shows that the assumption of many that atheism stands at the centre of secular thought is baseless. The first part, largely assuming an Israeli context, claims that this assumption is problematic from a sociological and historical perspective. The second part follows Jewish philosophers who use theological ideas at the centre of their thought, and at the same time do not fit into the realm of Jewish religious writing of the 20th century. The distinction between the ontological and the ethical “role” of God in the theology of Hans Jonas, Emmanuel Levinas and Martin Buber, is used to create new borderlines between the secular and the religious – “soft” borders that do not exclude God from secular world-views. In a chapter of his memoirs, the acclaimed Yiddish writer Isaac Bashevis Singer grants his readers some insight into the life of his father’s rabbinic household in Warsaw – a household full of contrasts and tensions between his parents’ conflicting personalities, between Hasidic and Mitnagdic tendencies and between mysticism and scepticism. Both his father’s mysticism and his mother’s scepticism were formative influences on Bashevis, and his writing constantly vacillates between these two world-views. Bashevis is well-known for his short stories about demons, dybbuks and other supernatural phenomena, but it is interesting to note that at times his demons clearly seem to be external manifestations of internal, psychological states of being, whereas at other times no rational explanation for an apparent supernatural phenomenon can be found. Bashevis’s narrators and protagonists constantly question God and express their scepticism about traditional Jewish beliefs, while, on the other hand, they are deeply influenced by Jewish mystical ideas. The conflict between rationalism and mysticism, between modern philosophy and Jewish religious beliefs, especially Kabbalistic ideas, never gets resolved in Bashevis’s works, but this continuous tension is exactly what makes Bashevis such a great writer!